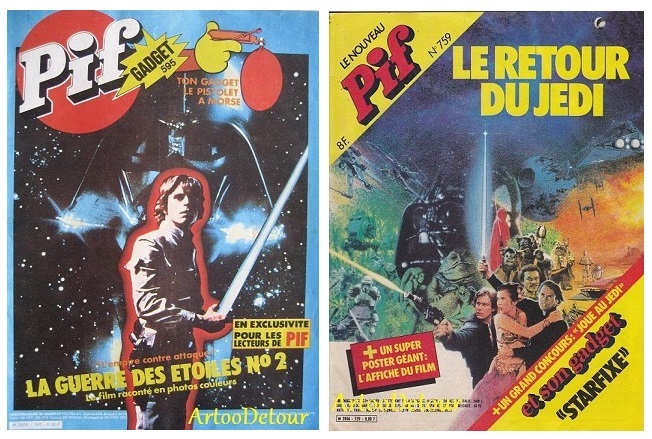 PIF Gadget was a French comic magazine that featured many cool SW related adverts between 1977 and 1986 including toys, articles, sweepstakes, posters, special issues, stickers, catalogues, and even a mini photographic-story series! The German version of PIF Gadget is 'YPS' - famous for the YPS Snowtrooper! 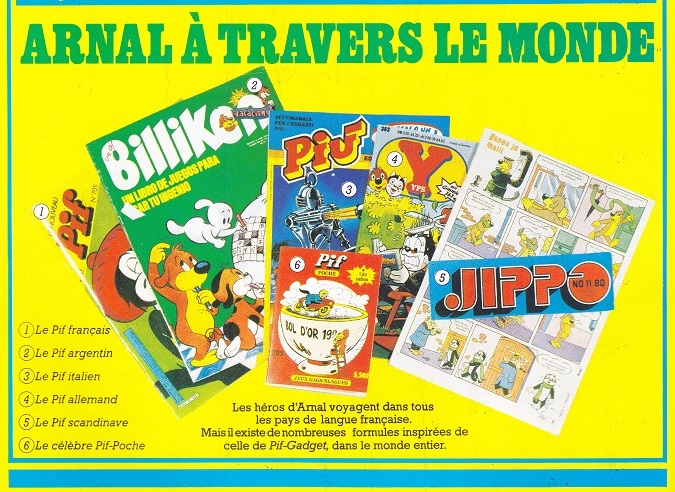 There was also a Scandinavian version known as 'JIPPO'; BILLIKEN (Argentina); and PIU' (Italy). France. 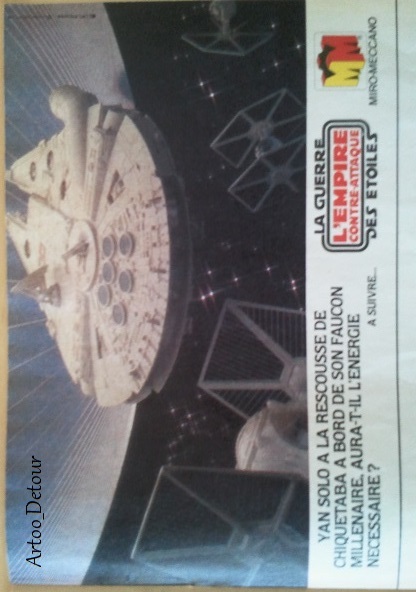 Star Wars Cartoon and Puzzle Pages from Pif Gadget 450. 1977. France. Meccano. Star Wars. Pif Gadget 474/479/482/558. 1977/78. France. Miro-Meccano. ESB. Pif Gadget 590. 1980. France. Miro-Meccano. ESB. Trampline Catalogue Page. Pif Gadget 608. 1980. France. Miro-Meccano. ESB. Pif Gadget 613. 1980. France. Content from Pif Gadget ESB Special 595. 1980. France. Bootleg Vader. Pif Gadget 656. 1981. France. Milky Way R2-D2 Offer. Pif Gadget 652. 1981. France. Miro-Meccano. Pif Gadget 683. 1982. France. Miro-Meccano. Pif Gadget 716. 1982. France. ESB Miro-Meccano Saynettes from Pif Gadget. June 1981 to May 1982. France. ESB Miro-Meccano Quarter Page Ads from Pif Gadget. September 1982 to December 1982. France. ROTJ. Miro-Meccano. Content from Pif Gadget 737. 1983. France. ROTJ. Content from Pif Gadget 758. 1983. France. Content from Pif Gadget ROTJ Special 759. 1983. France. Pif Gadget 760. 1983. France. Pif Gadget 763. 1983. France. Pif Gadget 765. 1983. France. Yoda Head Icons. Pif Gadget 765/792/793/794/795. 1983. France. Pif Gadget 818. 1983. France. Pif Gadget 830. 1985. France. 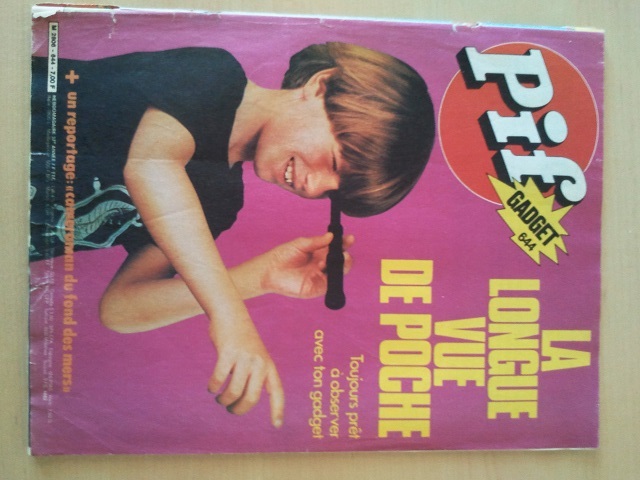 Pif Gadget 849. 1985. France. Pif Gadget 851. 1985. France. 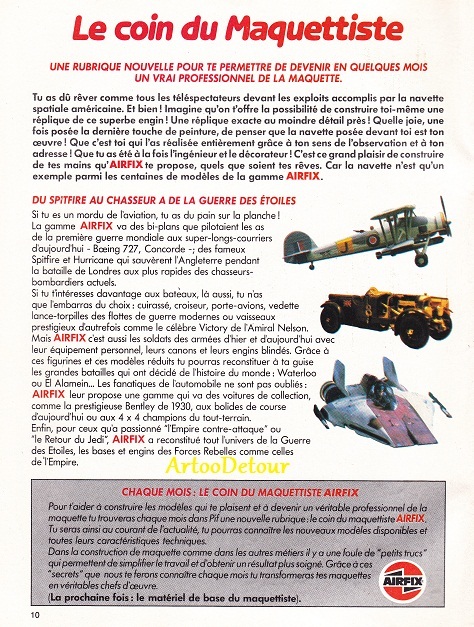 Content from Pif Poche Special Jeux. 1983. France. 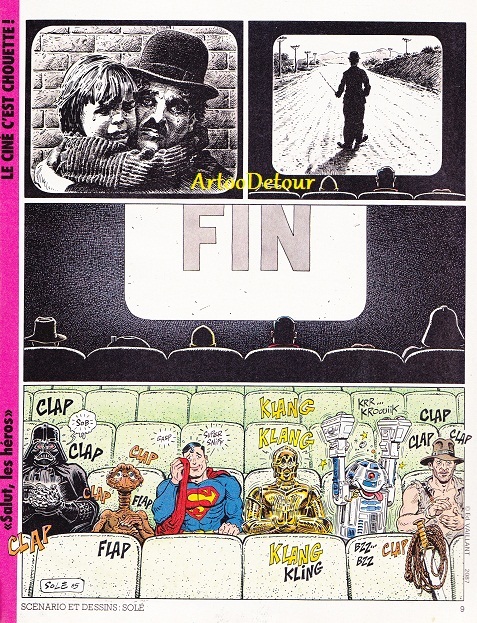 Back cover from Pif Poche 218. 1983. ....... approx 63 adverts! No easy task, especially as I wanted them in their complete condition inside the original issue and not loose cut-outs. Three five years on, I'm happy to say that my run is finally complete. 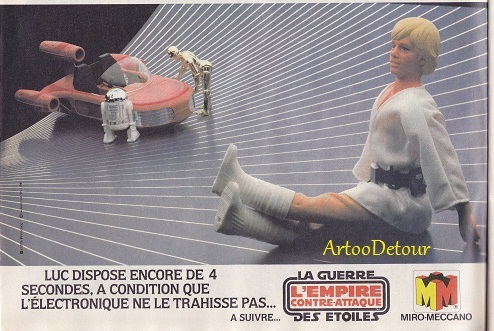 Along the way I also began collecting the non-toy adverts that were not featured in Meccano to Trilogo such as Figurine Panini, movie ads, articles and features - even making a few new discoveries that I've since shared with Stéphane Faucourt - who I'd like to thank for helping me out with some great info on PIF Gadget Star Wars ads! Thanks also to Arnold (Skywalkerhu) who helped me out with a few issues! Wow! Great side focus you've got there Paul. Some of those adverts are stunning. I'm not an odd ball colector myself, but I can certainly see the appeal of those. Just need #644 and 678 to complete the run. 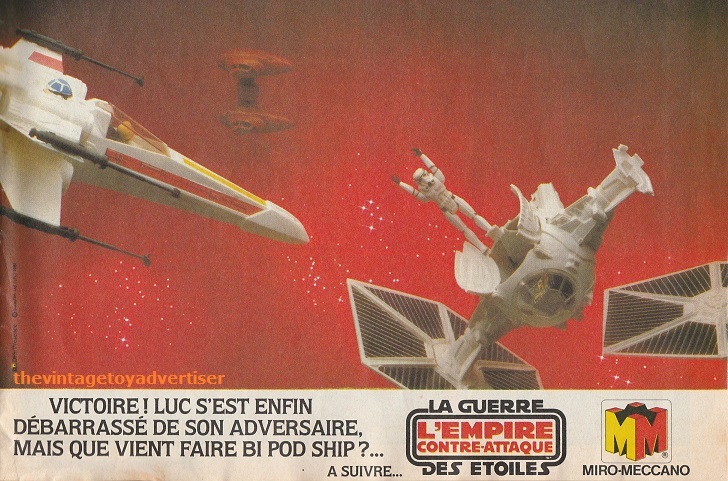 and a new discovery from Pif Gadget 1985 Airfix ad featuring an A-Wing model. I sent a scan over to Stephane as he was also unaware of this advert. love the ads! great stuff as always! What an incredible collection! 2 more to go.... Dang! Love the pictures in the adds. Wish I could read what they say... Thanks for posting them along with the history that you have documented about them. Thanks Paul for the feedback, it was a pleasure to help, you did very well with your PIF collection which is now probably even more complete than mine and it's also always a pleasure to see that my Meccano to Trilogo book helped discovering new fields of collecting, that's also what keeps the hobby running. Throughout nearly all of 2013 I've been searching for just two issues to complete this run which I started in 2010. These two issues have been an incredible pain in the arse to find. Just need issue 678 to finish the run! Yeah, some issues can be quite difficult to find; Congrats Paul !! All that's left to add are unknowns and one or two rarities not covered in the book. Wow, Paul! I haven't seen your limelight, great collection of PIF issues and thank you for your feedback!